The kidnapping of an Azerbaijani investigative journalist in broad daylight in Tbilisi raises questions about how far the west is willing to tolerate Azerbaijan's authoritarian slide. Afghan Mukhtarli has been charged with smuggling in Baku after being kidnapped in Tbilisi. Image: MeydanTV. On 29 May, an Azerbaijani journalist and political activist was kidnapped in Georgia’s capital Tbilisi and then illegally brought across the border to Azerbaijan, where he reappeared less than 24 hours later in Azerbaijani border police custody, Human Rights Watch said today. He now faces bogus, politically motivated charges of illegal border crossing and smuggling. 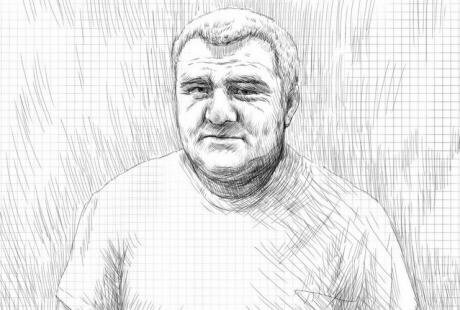 Georgian authorities should promptly investigate the kidnapping of the journalist, Afgan Mukhtarli, and Azerbaijani authorities should immediately release and drop all charges against him. Mukhtarli and his wife, Leyla Mustafayeva, also an investigative journalist, have been living in Georgia since 2015 to escape the Azerbaijani government’s vicious crackdown against its critics. There are fears that Mukhtarli faces the imminent threat of ill-treatment in custody. Mukhtarli, 43, is an investigative journalist who has worked for several independent and opposition media outlets, including the Institute for War and Peace Reporting, Meydan TV and others. His investigative stories exposed corruption in Azerbaijan’s Ministry of Defense, and the extensive business networks owned by Azerbaijani President Ilham Aliyev and his affiliates in neighboring Georgia. Mukhtarli continued his activism in Tbilisi and participated in a series of protests in front of the Azerbaijani embassy. Mukhtarli’s Facebook posts often criticized government corruption and the persecution of activists in Azerbaijan. Mukhtarli also alleged on Facebook that he was being subjected to surveillance by unidentified people. Mukhtarli’s and Mustafayeva’s residence permits for Georgia formally expired in September 2016, when Georgian authorities refused to extend them. But the couple continued to legally reside in Georgia, as Azerbaijani passport holders do not require visas for Georgia and can remain in the country for up to one year. On 29 May, at about 7pm, after meeting a friend in a café in central Tbilisi, Mukhtarli called Mustafayeva to let her know that he was on his way home. But Mustafayeva told Human Rights Watch that Mukhtarli did not return. The next morning, Mustafayeva filed a missing person’s report with the local police and alerted local media and civil society groups. On the afternoon of 30 May, Mukhtarli resurfaced in Baku, in the investigative unit of the State Border Service of Azerbaijan. Mukhtarli told his lawyer, Elchin Sadigov, who spoke to him in custody, that unidentified men stopped him a few blocks from his house, pushed him into a car, and drove him to a park, where they put a bag over his head and beat him. His captors spoke Georgian among themselves and addressed him in Russian. After he complained that he could not breathe and had heart problems, the assailants instead blindfolded him with a shirt and used scotch tape to hold it in place. Sadigov told Human Rights Watch that Mukhtarli’s nose was broken and he saw bruises on his forehead, left temple, right eye, and elsewhere on his face. Mukhtarli also complained of severe pain in his chest, which he believed was caused by a fractured rib. Mukhtarli told Sadigov that his captors changed vehicles twice. The assailants in the second vehicle spoke Azeri and brought him to an Azerbaijani border checkpoint in Balakan district at about 11pm on 29 May. At the checkpoint, unidentified people removed his blindfold and told him that he had illegally crossed the border, and someone also planted €10,000 on him. Azerbaijani authorities held Mukhtarli at the border checkpoint overnight and in the early hours of 30 May took him to a nearby closed border pass zone, and photographed him to make it look as though he were trespassing there. At this point, Azerbaijani authorities detained him, handcuffed him, and transported him to Baku. Azerbaijani law requires a person to show a valid passport before crossing the Azerbaijani-Georgia border, but Mukhtarli’s passport remains in Tbilisi. Georgian authorities should immediately investigate Mukhtarli’s kidnapping, including whether Georgian law enforcement agents were complicit in illegally transferring Mukhtarli across the border or whether they actively participated in his kidnapping, Human Rights Watch said. Both Georgia and Azerbaijan are members of the Council of Europe and parties to the European Convention on Human Rights, and any involvement of, or acquiescence by, state agents in the kidnapping and transfer of Mukhtarli to Azerbaijan is a serious violation of the convention. Mukhtarli is expected to face a closed court hearing on 31 May, to determine whether he will be held in pretrial custody during the investigation.